The Lewis & Clark County Sheriff’s Reserve program is a volunteer force of sworn peace officers. The sworn Reserve Deputies operate directly under the authority of the Sheriff. The Reserve program provides an opportunity for members of the community to increase their knowledge and education in law enforcement, while facilitating personal growth. The Lewis & Clark County Sheriff Reserves assist full time Deputies from the Lewis & Cark County Sheriff’s Office in performing a variety of duties. There are many duties a Reserve Deputy may be assigned to perform including: field operations such as general law enforcement and patrol, campground security checks, Bureau of Reclamation security checks and special events. Reserves are active with the Lewis & Clark County Last Chance Stampede and Fair, Roller Derbies, the Passion Plunge and other community and contracted events. Reserve Deputies may also be assigned to assist in the Detention Center, evidence operations and management of, natural disasters occurring in Lewis & Clark County. Reserve Deputies are well respected as an important part of the Sheriff’s Office. Reserve Deputies are required to meet the training requirements set forth by, and work within, Montana State Law. 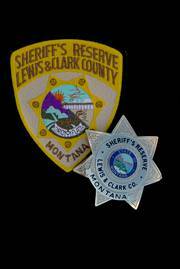 The Lewis & Clark County Sheriff’s Reserve program is a two year training program in which Reserve Deputies receive all required training to meet and substantially exceed the State of Montana minimum standards.